Sedgeford is a large parish in northwest Norfolk. It is within the King’s Lynn and West Norfolk District Council. The parish has been subjected to intensive archaeological research by the Sedgeford Historical and Archaeological Research Project (SHARP) since 1996. This has resulted in an unusually full archaeological record and we are able to reconstruct the use of the landscape over time to a greater extent than in many other parishes. SHARP is a large-scale, long-term, multi-disciplinary research project. 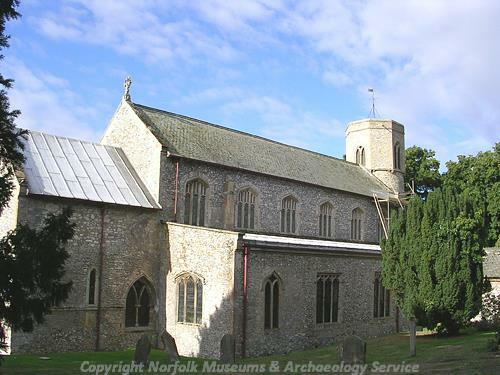 Its aim is to understand the changing landscape use within a “typical” Norfolk parish. This is being achieved through the use of a variety of different archaeological techniques. There are database records for the fieldwalking, metal detecting, trial trenches, test pits, building evaluations and full scale excavation carried out by the project. The parish was selected for early analysis by the Norfolk National Mapping Program and consequently a number of previously unrecognised cropmark sites have also been recorded. The number of records continues to grow as SHARP continues into its second decade of research. The village name derives from Old English and means 'place where sedge grows'. The research carried out by SHARP has demonstrated that there has been local activity back to the prehistoric period and the parish was the site of a significant Saxon settlement. It is mentioned in the Domesday Book, where it has a complicated multiple entry. The wealth of evidence gathered from the area is very difficult to summarise and what follows is not exhaustive. The full records should be examined for more details. The earliest archaeological site within the parish is a possible Neolithic mortuary enclosure or long barrow (NHER 43431). Other prehistoric burial sites include a number of Bronze Age barrows. Most of these have been identified from aerial photographs and only survive as ring ditch cropmarks (NHER 1622, 11894 and 12829) although one can still be seen as a faint earthwork (NHER 11590). To the east of the parish a cluster of these monuments represents a dispersed barrow cemetery (NHER 45008). The cemetery comprises fourteen ring ditch cropmarks. 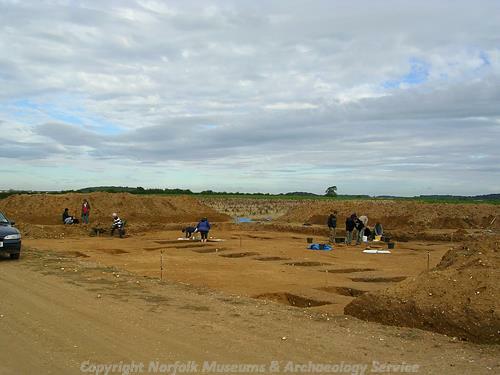 Excavations by SHARP on the Boneyard field (NHER 1609) have recovered worked flints possibly dating back as early as the Upper Palaeolithic or Early Mesolithic. Although no archaeological features of this date have been encountered the number of Mesolithic microliths recorded suggest there was occupation at this date nearby. Other prehistoric finds include a Palaeolithic axehead (NHER 1594), Neolithic axeheads (NHER 1596, 14880 and 16494), a Mesolithic axehead (NHER 1594), other Mesolithic worked flints (NHER 1595) and a piece of Bronze Age pot (NHER 1599). Aerial photographs reveal the presence of a Bronze Age or Iron Age farmstead to the east of the parish (NHER 43405). SHARP has uncovered other evidence of Iron Age activity. On Boneyard (NHER 1609) Iron Age features include a horse burial and a ditched enclosure. A hoard of at least thirty-nine gold Iron Age coins, some hidden in a cow bone, was found in the entrance to this enclosure. A large east to west 1st century AD Iron Age or Roman ditch containing high status pots has been recorded. Other excavations by the project have revealed the presence of Iron Age ditches (NHER 36665 and 39459) and post and stake holes (NHER 39459). It is difficult to pull together this fragmentary evidence into any coherent whole but it appears that the landscape was settled, and probably divided into small farmsteads. The small enclosure at the base of the valley, where coins and high status pottery was deposited, may have had a ritual function. A comparatively large number of Iron Age objects have been recovered from the parish, but this may simply be a reflection of the increased archaeological activity here. They include coins (NHER 39459), large amounts of pottery (NHER 1601) that may come from an Iron Age or Roman settlement and two parts of the same torc recovered some thirty years apart (NHER 1600). An intriguing Late Iron Age or Roman head (NHER 23321) has also been recorded. This may be votive or have been used for divination. In the Roman period the Peddar’s Way (NHER 1289) passed through the undulating hills on its way up to the coast at Holme. A number of possible Roman enclosures and field systems can be seen on aerial photographs (NHER 43354, 43371 and 43373). Aerial photography has also identified a Roman farm or settlement (NHER 13070). A second small farmstead has been discovered by SHARP (NHER 31814) and partially excavated. A series of Roman ditches may form part of an enclosure around the farmstead. 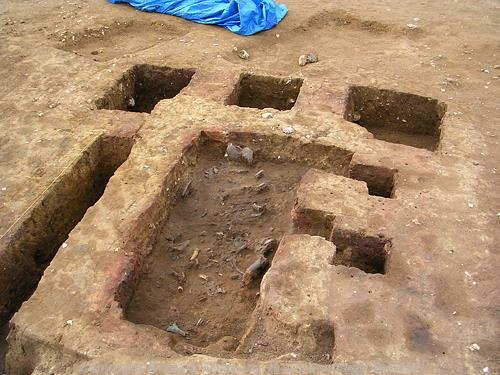 Within the enclosure a 4th century AD corn drier containing the disturbed remains of a middle-aged man were discovered. It is thought the body was placed within the corn drier in an attempt to dispose of the corpse. The parish also contains the site of a possible Roman villa (NHER 1603). This scheduled ancient monument was discovered in 1944 and has never been excavated although Roman tiles, tesserae, pottery and wall plaster have been recovered. In addition to these sites a large number of Roman finds have been recovered, especially from the south of the parish where SHARP’s metal detecting and fieldwalking surveys have concentrated. Finds include pottery (NHER 1471, 1602 and 1608), coins (NHER 1470, 23108 and 23109) and a millstone (NHER 13809). The Saxon period has been intensively researched in Sedgeford but is still not completely understood. The parish contains an Early Saxon inhumation cemetery (NHER 1473) and there are records suggesting some urns from an Early Saxon cremation cemetery were recovered from the village in the 19th century (NHER 1611). Another Early Saxon urn has been recovered from Eaton Farm (NHER 13882). A Middle Saxon kiln or oven recorded by NAU close to the Boneyard site (NHER 1079) and a Middle Saxon hearth on Church Lane (NHER 29745) suggest activity was concentrated in the bottom of the valley at this period although it must be remembered that most archaeological activity is also concentrated here. It may be significant, however, that no Saxon remains have been recovered on the excavated site of the Roman farm higher up the valley (NHER 31814). 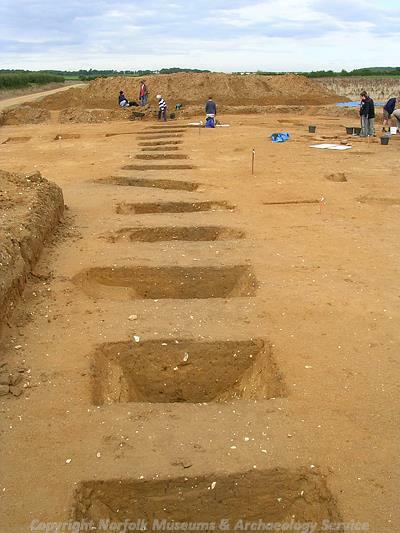 SHARP’s research in the first ten years has concentrated primarily on the site of a Middle and Late Saxon settlement and cemetery on Boneyard field (NHER 1609). The Boneyard site was first excavated in the 1950s when it was identified as the site of a possible Late Saxon cemetery. Subsequent investigations by SHARP since 1996 have revealed a complex sequence of archaeological deposits. Middle Saxon settlement evidence includes hearths, occupation surfaces and a possible grubenhaus. The inhumation cemetery is now thought to date to the Middle to Late Saxon period. Over 270 skeletons have been excavated. These Christian burials were all laid east to west without burial goods. Most of the bodies were shrouded although some were placed in coffins. Late Saxon rubbish deposits were placed over the cemetery before part of the area was deliberately flooded in the 13th century to create the Reeddam (see NHER 1605). Excavations in the more waterlogged area of the valley floor (the Reeddam, NHER 1605) revealed that the intensive use of the cemetery (in this area up to four phases of inter-cutting burials have been recorded) ended when the valley was flooded as part of a management scheme to grow reeds in the medieval period. The medieval ditches excavated in other parts of the valley floor (NHER 36665 and 39459) may also relate to the flooding scheme. The focus of activity in the parish during the Saxon period seems to shift around the valley floor finally settling around St Mary’s Church (NHER 1615). The church has a Saxon or Norman tower but the rest of the structure dates to the 13th and 15th centuries. The shifts in settlement pattern were revealed by SHARP’s various excavations and the large number of test pits dug by SHARP’s Village Survey from 2000 to 2002. These have recovered varying amounts of Early, Middle and Late Saxon pottery which have been used to demonstrate where activity took place. Other Saxon finds include an Early Saxon brooch (NHER 23764), an Early Saxon gilded silver tremissis coin pierced for suspension (NHER 39892), two Late Saxon mounts (NHER 13968 and 14367), and a Late Saxon Borre style disc brooch that is now SHARP’s logo (NHER 31814). SHARP’s investigations have not solely concentrated on excavations. Many of the buildings within the village have been surveyed and an in-depth documentary survey has also been carried out in collaboration with local historians. Fieldwalking and metal detecting surveys have taken place in the southern part of the parish. Together these have helped us to understand the medieval landscape of the parish in greater detail. St Mary’s Church (NHER 1615) has been intensively researched. Most of the structure dates to the 13th and 15th centuries. It may have been rebuilt in the Tudor period. The chancel was partly demolished around 1770. The church was once a Peculiar of the Dean and Chapter of Norwich Cathedral. The church and graveyard has been extensively investigated and recorded by SHARP. These investigations include a gravestone survey, building recording and resistivity surveys. The resistivity surveys have identified the layout of the demolished east end of the chancel. The sites of two deserted medieval villages have been recorded – Eaton (NHER 1472 and 11263) and Gnattingdon (NHER 1618). The exact location of these two settlements remains somewhat unclear and in the past the evidence has proved very confusing. It is now generally thought that Eaton was to the west of the parish located near Eaton Farm and that Gnattindon was probably to the east near the junction of the Peddar’s Way (NHER 1289) and the present Docking Road near East Hall (NHER 14547). East Hall (NHER 14547) was one of several medieval manors within the parish. It stands on the site of an earlier shepherds cottage. The house is shown on a map made in 1631 and is described in the parliamentary survey 1649 as 'of competent largeness' with barns. The present flint and carstone building is basically 17th century. Another manor was located at West Hall (NHER 15010), a 17th century carstone and brick two storey building. It has been suggested that this was the site of a moated manor of the priory of Norwich. The site of the Great Mill that belonged to this estate has also been recorded (NHER 1617).The 1649 parliamentary survey describes a brick and stone house with stable on the site of the present building. A third medieval manor was probably located to the west of West Hall. Parts of this third manor have been excavated on Dovecot Field (NHER 33616). The site of another medieval mill, Kyme Mill (NHER 1474), has also been surveyed. Nearby Kyme Bridge (NHER 45473), a medieval structure, has been investigated. Two further watermills on the Heacham River have been identified (NHER 13952 and 31979) and the site of a medieval windmill (NHER 31978) is on Windmill Hill. Extensive cropmarks of medieval field systems (NHER 43330, 43350 and 43351) can be seen and the course of former roads has been recorded from old maps (NHER 1590) and on aerial photos (NHER 43397, 43406 and 43414). SHARP has investigated the history of many of the post medieval buildings in the village and individual records should be consulted for details. What follows is a very small selection of highlights. Magazine Cottage (NHER 1623) was built in 1640 as a Royalist magazine in the Civil War. Sedgeford Hall (NHER 13176) was built in the mid 18th century. The north wing was designed by David Roberts and built between 1963 and 1967. The interior was mostly remodelled in the 1960s but one first floor room contains early 18th century moulded panelling that may have come from Holkham Hall (NHER 1801). The Old Buck (NHER 47100) is a 17th century whitewashed clunch house with a red pantile roof. It was formerly The Buck Inn. Greyfriars (NHER 46921) is a former rectory house of about 1840 built in carstone with brick dressings in Tudor-Gothic style. The post medieval tower windmill (NHER 1630) still stands, now within a modern housing estate, and has been converted into a house. The sites of two different post medieval windmills are recorded on old maps (NHER 31976 and 31977). Sedgeford was the location of an important World War One airfield (NHER 13162). The site was subsequently used as a decoy airfield during World War Two. Some World War One buildings survive including the officers' mess, officers' quarters and a rare air raid shelter. The World War One airfield opened in 1915 and closed in 1920. At the start of World War Two, the surviving buildings from the airfield, which included the hangars, made the site ideal for use as a decoy airfield. Other World War Two remains include pillboxes (NHER 43319 and 43320) and the site of spigot mortar emplacements and a possible weapons pit (NHER 43345). The NMP identified a previously unrecorded World War Two military site, possibly a radio transmitter or receiver station (NHER 43366). The most recent archaeological find was that of a modern dog skeleton (NHER 49923) excavated by SHARP at Glovers Farm during the Village Survey. This rapid overview gives a flavour of the results of the intensive survey carried out over the parish by SHARP and others. The individual records should be consulted for further details. Megan Dennis (NLA), 18 April 2007.
http://www.sharp.org.uk/, Accessed 18 April 2007.